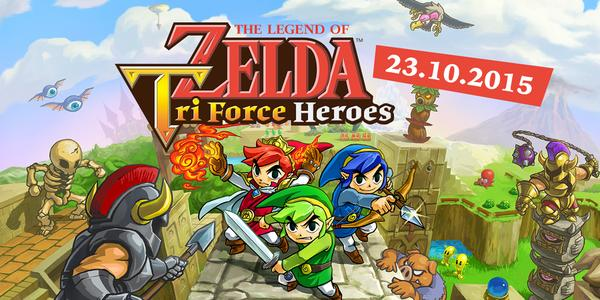 Combine the powers of three Links in The Legend of Zelda: Tri Force Heroes for Nintendo 3DS family systems! Work together as a dynamic trio, don different outfits to gain new abilities, and save the fashion-obsessed kingdom of Hytopia -where sartorial elegance is celebrated- from a ghastly curse. An evil witch has placed a mysterious spell upon Princess Styla, casting the realm into disarray. Citizens call for the return of a legendary trio of "Totem Heroes" to protect them. Answer King Tuft's call for heroes to rid the princess of a hideous new outfit and restore style to Hytopia. Embark on a quest outfitted for three, with each player controlling one Link each. Travel to eight different areas of the Drablands, from icy caverns to red hot volcanoes, and explore over 30 levels brimming with puzzles, traps and baddies. Presented in the same top-down style as the critically acclaimed A Link Between Worlds game, prepare to solve inventive puzzles as a team and dress Link in a range of outfits to enable new abilities that enhance your adventure. Buddy up with two other heroes online or via Local Play. With Download Play, three friends can play together using just one copy of the game, and they can even carry some of their progress over to the full game. You can also take on levels yourself by enlisting the help of statue-like companions called Doppels to give you the might of a trio! All three heroes are bound to the same Heart Meter, so help each other out and use the icons on the Touch Screen to communicate with your comrades: request their help, give them hints and cheer them on. 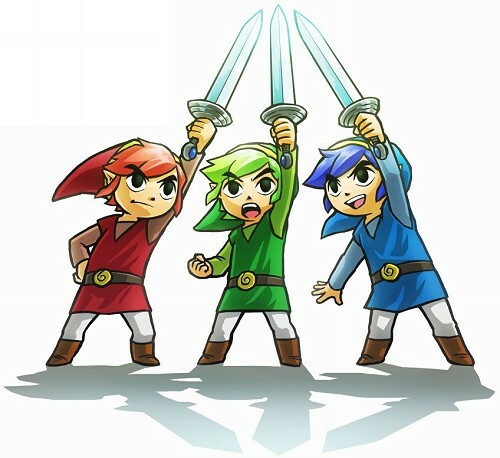 Two or three Links can stand on each other's shoulders and form a totem to solve perplexing puzzles, throw players to higher ground and tower over the most fearsome opponents. Use the rewards from your adventures to craft over 30 stylish new outfits. These outfits not only change your hero's look, but also bestow them with unique abilities: grab the Goron Garb to swim through lava, don the Kokiri Clothes to power up your arrows or throw on the Legendary Dress to increase heart drops. For even rarer loot, work together with other players to revisit levels and take on new challenges, or fight against them in the Coliseum in free-for-all battles. Bring your choice of outfit into one of eight arenas and fight it out using whatever items you can get your hands on to win rare rewards. Triumph in a trio and bring fashion back to Hytopia in The Legend of Zelda: Tri Force Heroes for Nintendo 3DS family systems.